Cold Weather Skincare Essentials. | By Millie. Winter, for me, equals dry skin...anyone else? As soon as the colder weather hits I all of sudden turn into some kind of snake who starts shedding their skin. Attractive right. But seriously, it's an issue I battle with every single winter, so I always rummage through my skincare stash to see what I can use to help add some moisture to my skin. The products I'm going to mention aren't particular to any AM, or PM routine, apart from the serums but I'll get onto that! I pretty much whack these out when I feel the need to, and whenever I feel like my skin is in dyer need of some hydration. So, all the time pretty much. Glow Recipe Watermelon Sleeping Mask: Oohh lorddyyy, this is what parched skin dreams are made of. If you have dry/dehydrated skin you need this in your life. In the UK you can purchase this from Cult Beauty, and if the millennial pink packaging doesn't sell it to you, then what's inside certainly will. It's quite a liquidy formula which sinks in surprisingly well, yet leaves your skin so so soft and nourished. I either use this overnight, or in the morning if I'm having a no-makeup, at home day. It doesn't leave any residue on your pillow which is also a bonus! The scent is amazing as well, super fresh! Kiehls Midnight Recovery Concentrate: This stuff seems to always creep back into my routine. 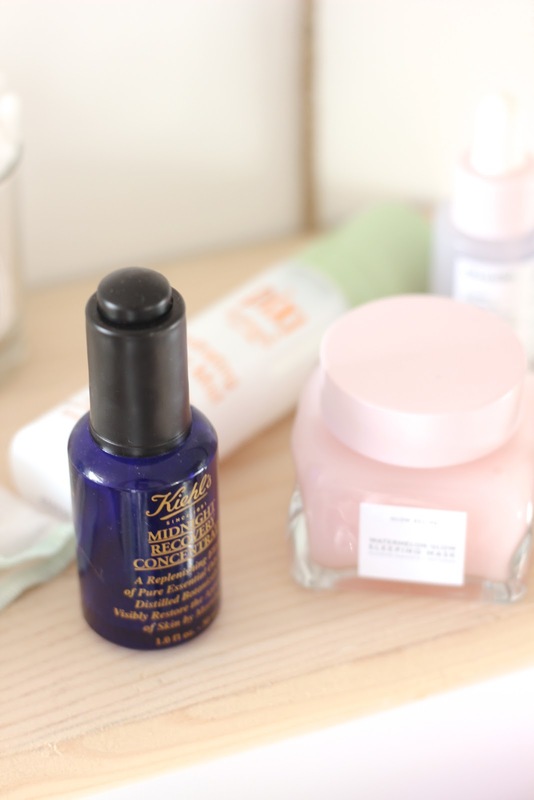 It seems to cure all my skins woes, so of course I'm including it in todays post. This is something I tend to use exclusively in the evenings as part of my PM routine. I pop this on before my moisturiser and I just love how my skin looks in the mornings. The formula makes my skin feel, and look, so glowy and nourished. I can't get enough. If I'm having an extra dry skin day, and I know my makeup is going to look hella sketchy, then I will put this on in the morning and it keeps my skin hydrated all day long. Glossier Super Bounce Serum: Out of all the Glossier serums, this one definitely seems to be the most loved. And for good reason. Even though £24 only gets you 15ml of product (boooo!) it's an amazing formula which my skin laps up in the morning. For dehydrated skin this is a must-have, and even if you're not really buying into the Glossier hype, I do think this is worth it. Pixi Hydrating Milky Mist: This is quickly becoming one of favourite skincare products EVER. It makes my skin feel so plumped, and so hydrated, I can't put it down. Even in the summer, this was a must for me, so it's no surprise I'm still obsessed. I tend to spray this into my hands, then pat it onto my skin. This way, I feel like I'm not wasting any of the product, and by pressing it in it can get to work straight away. Although the spray is very fine and lovely, I just find half of it misses my face and disperses around the room. A good tip if you have the same issue. 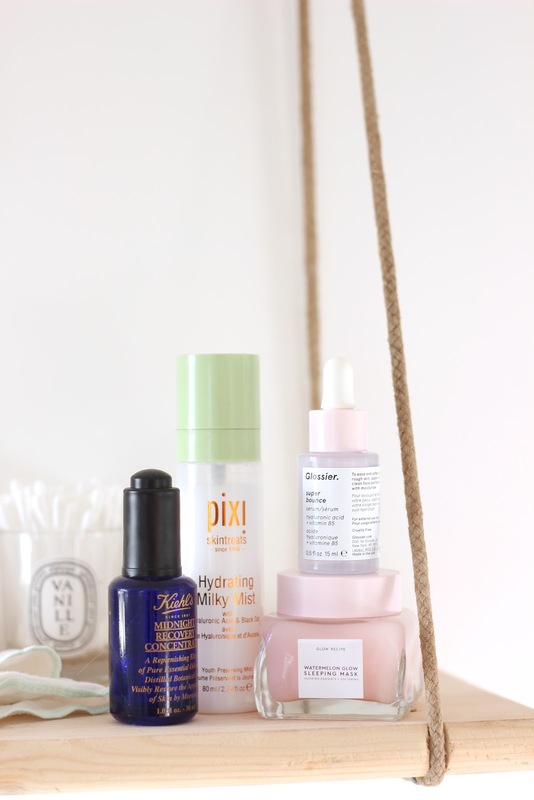 So there's a quick little run-down of some of the skincare products I've been loving lately. If your skin is dry, or dehydrated, these all work wonders for me so I highly recommend them! 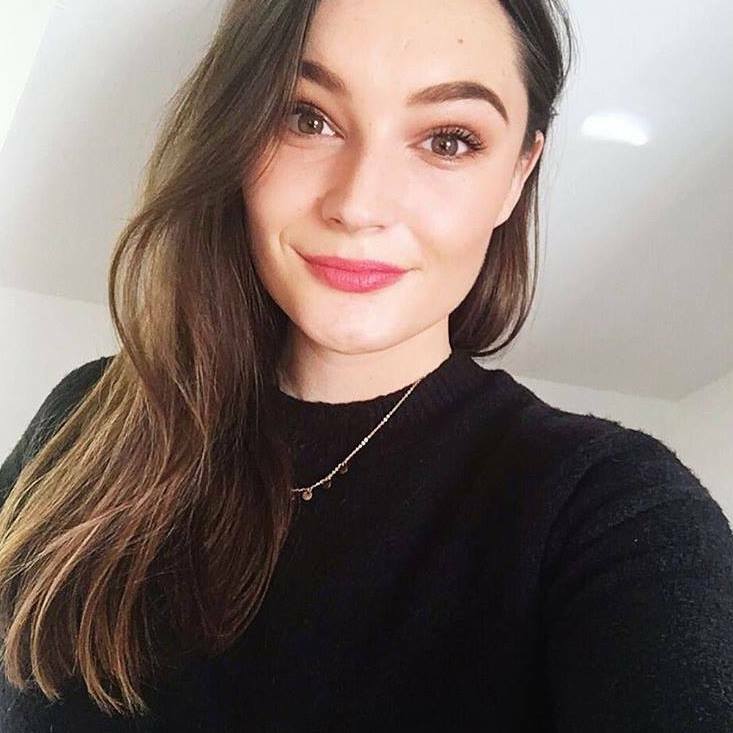 If you have any other skincare bits and bobs you think I'd really love, then please let me know, I'm always on the hunt for new, amazing skincare.